I would never have read this book but for the fact it was this month’s selection for my book club. So I persevered through to the bitter, bonkers end of what is known in these parts as GIRL IN A COMA. The book unfolds in three narrative strands. One is Amber’s present, it’s Boxing Day and she is in a coma. Though not, alas, enough of one to stop the whining. The second thread starts about a week before that and teases out the events that led up to the coma. The third is extracts from childhood diaries that, presumably, provide some insight into a corresponding adult’s life. 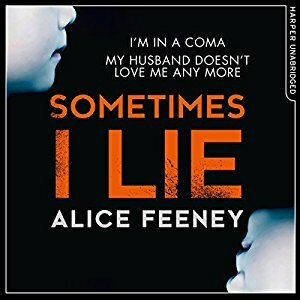 This multiple timeline structure has become a common approach to storytelling but to be as fair as I can – given I wanted to pull the plugs of every machine keeping fictional Amber alive – Feeney handles the complexity as well as anyone. The writing is not the problem here. The problem is that when a book uses an admittedly unreliable first-person perspective that central person has to engage me. Amber didn’t. She is self-absorbed and takes everything so bloody seriously I wanted to carry out physical harm. If you can’t find a little bit of self-deprecating humour in the life you are sharing with others then you should at least be fabulously windswept and interesting. Amber is not. Amber is full of angst at the petty injustices of her world. Amber is a colossal bore whose potential demise I cared nothing about, except to hope for it to become a reality sooner rather than later. As far as suspense goes it is almost the half-way point of the book before anything approaching drama starts to build (the coma itself doesn’t count as it is announced on the book’s front cover). That’s quite a lot of boring details of an uninteresting life to wade through before anything vaguely interesting arrives. Things do pick up after this. There are the requisite twists and lots of ‘reveals’ but for me it was too little, too late. The book is another in that category where an interesting or quirky premise is not backed up with nearly enough depth. A book needs to be much more than its blurb. This entry was posted in Alice Feeney, book review, England. Bookmark the permalink. A shame you didn’t enjoy this one. But you didn’t enjoy it in such an entertaining way, I can’t be that sorry.